A sensor trigger lets you start a macro when a sensor is tripped, or changes states. Generally, all you have to do is pick your sensor and hit OK. But of course this has more capabilities than that, so read on. Sensor - Here you choose the sensor to monitor. You can choose from the sensors already added by clicking on the right side of the combo box. This will list all of the sensors that have been added so far. Just click the sensor in the list that you want. 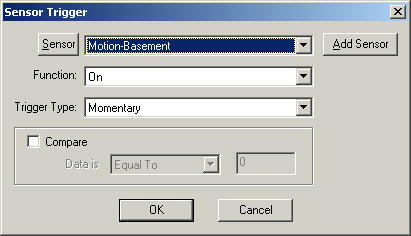 If you need to use a sensor that you haven't added yet, click the Add Sensor button and you can add it right from here. If you want to see the settings for the sensor or change them, click the Sensor button on the left side of the screen after you've selected a sensor. Function - A sensor can be on, off, or a variety of other X10 type signals such as dim or bright. Whatever you choose here is what the sensor needs to send in order for this trigger to trip. So you can make it so it only trips when the sensor goes off. In general though, you will leave it at the default of On. Type - This indicates whether this trigger is a momentary trigger or a continuous trigger. If the sensor is used alone, you will probably always want to set it to "Momentary", otherwise if it is set to "Continuous" your macro will trigger over and over again until the sensor's status no longer matches the function. If you have more than one trigger and all of the triggers must be active, then you may want to set it to "Continuous", however at least one of these triggers should be set to "Momentary" or the macro may fire repeatedly while all the triggers are activated. Compare - Compare can be used generally if the sensor send the Dim or Bright command. You can choose to only trigger if the status matches the function and the data sent by the sensor is either equal to, greater than or less than the value you specify. OK / Cancel - If you click OK, any changes you've made will be saved, otherwise if you hit Cancel, all changes (except for any sensor additions or changes) will be discarded.